This March 28, 2017 file photo, Dwayne Johnson, a cast member in the upcoming film "Baywatch," addresses the audience during the Paramount Pictures presentation at CinemaCon 2017 in Las Vegas. 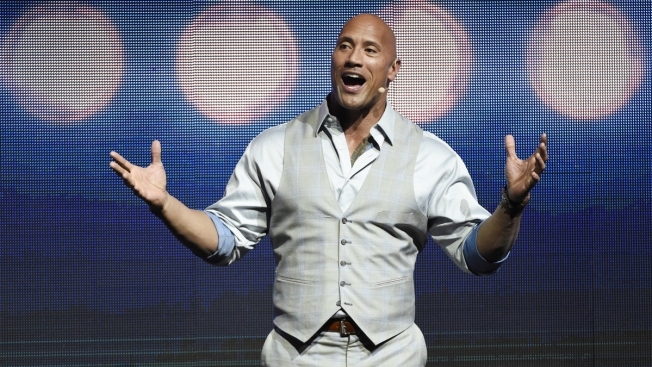 Is Dwayne "The Rock" Johnson going to rock the vote in 2020? Something might be cooking. Johnson, the highest paid movie star on the planet and a committed dad, told GQ that he's thinking about running for president of the United States. "I think that it's a real possibility," the "Baywatch" actor confessed. "A year ago, it started coming up more and more. There was a real sense of earnestness, which made me go home and think, 'Let me really rethink my answer and make sure I am giving an answer that is truthful and also respectful.'" In the no-holds-barred interview, the 45-year-old actor, who did not publicly endorse any candidate in 2016, also tackles the topic of the controversial travel ban proposed by President Donald Trump. "I completely disagree with it," Johnson said without hesitation. "I believe in our national security to the core, but I don't believe in a 'ban' that bans immigrants. I believe in inclusion. Our country was built on that, and it continues to be made strong by that." As for how he thinks our current president is doing so far? "I'd like to see a better leadership. I'd like to see a greater leadership. When there's a disagreement, and you have a large group of people that you're in a disagreement with--for example, the media--I feel like it informs me that I could be better," Johnson said. "We all have issues, and we all gotta work our s--- out. And I feel like one of the qualities of a great leader is not shutting people out. I miss that part. Even if we disagree, we've got to figure it out." If Johnson does run, believe he'll get the backing of some serious Hollywood heavyweights. Ron Meyer, the NBCUniversal vice chairman, told GQ, "If [becoming the president] is something he focused on...he probably would accomplish it. I think there's nothing that he couldn't do." When asked if he'd vote for the superstar when it came to election day, Meyer, whose studio produces the "Fast & the Furious" franchise, said, "I would vote for him without a question." The June issue of GQ will be on newsstands in New York and LA May 16 and nationwide May 23. Disclosure this station is owned by NBCUniversal.